Discover two simple techniques to create the look of carved stone while making these Delightful paper weights. 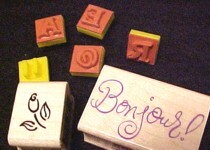 Kids as well as teens and adults will enjoy making and using these popular message stones on their desk. Make sure to collect a few rocks on your next adventure to use as a base for your memorable keepsake stones! 1. ALMOST thoroughly blend your scraps from past projects to create this variegated or marbled muddy color clay, or use some yellow, red and a pinch of white and blue to form a natural rock color. 2. Roll to 1/8" thick sheet (or run through pasta machine at setting #1) large enough to fit around rock, leaving the bottom of rock raw to add a felt furniture protector later. 3. Coat the rocks with Tacky glue and wrap with clay 'blanket'. 4. 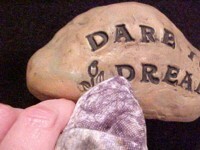 Large "Dare to Dream" Stone: While clay is still soft and moist, stamp to impress message words with rubber stamp letters and allow clay to dry thoroughly. 5. 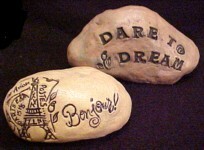 Small collage rock: Follow steps 1 through 3 above, then ink rubber stamps and press onto clay surface. Allow to dry, then seal surface by brushing on an even layer of glaze. Allow to dry completely. 6. To accent large rock letters, tap paintbrush tip into letters with acrylic paint and immediately wipe excess paint with moistened soft cloth or paper towel, leaving paint in the letter crevices. Allow to dry then brush on one more coat of glaze. 7. Secure a felt pad (cut to fit) to bottom of stone with Tacky glue to prevent scratching desktop or furniture. Enjoy your inspirational stone or give as a gift to someone special!